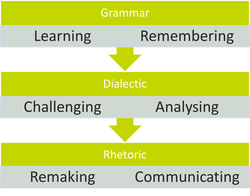 These three phases are called, respectively, grammar, dialectic, and rhetoric. This first step in learning any subject is to learn the vocabulary. For example, when you learn to read, you learn the names of the letters and the sounds they make. Classical educators call this the grammar stage. Young children enjoy this phase: they love repeating songs, chanting rhymes, and pronouncing big words. This is the phase Kindergarten and First Grade students are in. And is the first phase for learning anything no matter how young or old you are! This second step in learning a subject is to sort, compare, and understand the words and the rules that apply to them. For example, when learning to read, students will learn how to put letters together to form words and how to construct a sentence. We call this stage the dialectic (or logic) stage because much of the work done in this process is accomplished through dialogue. Children generally enjoy this process most between the ages of ten and thirteen. The third stage in learning a subject is to use what you have learned to solve a problem, write an original paper or speech, or lead a discussion. In reading, this would be the time to focus on the themes and context of what you have read and to apply the lessons learned to one’s own life experiences. Older teens usually enjoy this process because they long to express themselves and be creative problem solvers. We call this the rhetoric stage. Classical schools vary in their definition of “classical.” Some educators believe that classical education simply means adding Latin to a modern education; others define it as the study of classical works of literature. When we say “classical,” we are referring to the three stages of learning listed above, which guide our teachers and all that we do. This is the classical model of education that was used by the great thinkers and leaders of the past, including Aristotle, Plato, C.S. Lewis, and Thomas Jefferson. Classical education is sometimes called “leadership education” because it builds skills needed for leadership: logic, debate, public speaking, clear reasoning, researching, writing, and communicating. These skills are practiced in every subject (math, science, history, geography, Latin, fine arts, and more), which prepares students to become leaders in any field they pursue. Please call us at 970-731-3512 or fill out the form below.